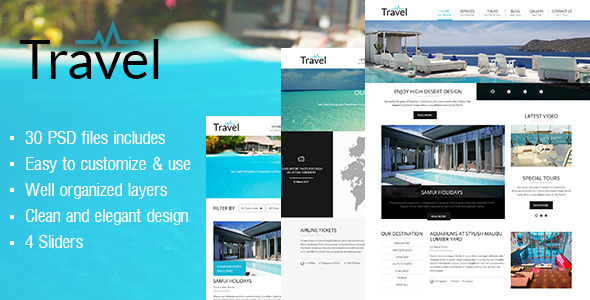 Travel is a multi-page website and a theme Multipurpose. The site has been designed for travel agency, tour operator, travel blog, but thanks to his creative graphics, simple, modern, flat and clean well suited to any business. Thanks to its excellent structure and layout of the theme you can use Travel for all services related to tourism such as hotels, resorts, honeymoon, cruise, travel and much more. For lovers of travel, Love Travel adapts awesome to talk about your trip and your holiday between sea and mountains in both summer and winter. Travel may also be suitable for your creative agency (web agency). The theme has been designed using the 1048 px grid system with 12 columns. This entry was posted in psd-templates and tagged flat, minimal, travel by Acty. Bookmark the permalink.